This is not an usual story of success. Because to attain this level of success, Ashish Goyal had to go much beyond than just to struggle. He fought his way to success through his grit and courage and is an inspiring role model for the people who hold grudges against the God for pushing them hard on the pedestal path. Ashish Goyal has many ‘Firsts’ to his name which made him an exceptional talent. A Mumbaikar, life rolled smoothly for Ashish till he suffered from partial blindness at the age of 9 and by the time he turned 22, he was completely blind. However, Ashish was determined to fight against all odds that life was going to offer him. A student of NMIMS, Mumbai, he proudly stood second in his college and was awarded with the ‘Dun & Bradsteet’ student award for being the ‘Best Student’. Ashish expected life to reward him for his accomplishments. But reality was totally different and all his exhilarations were doused by the nauseating attitude of the corporate employers who rated his disabilities higher than his merits. Ashish was asked to apply only for the government jobs as private sectors had not much consideration for such people. However, his indomitable spirit brought him success and based on his merits he was hired by ING Vysya Bank as Fixed Income Trader in Bangalore. Ashish had a burning desire to go for the higher elevation in life and this propelled him more for the success. Ashish decided to fight his odds and decided to create a platform for himself where not many had trodden. Ashish went onto do his MBA from one of the most prestigious institute, Wharton Business School, Philadelphia in the year 2010. He was the first blind student at Wharton and was awarded with ‘Joseph P Wharton’ award, given annually to the student who symbolizes ‘Wharton’s way of Life’. 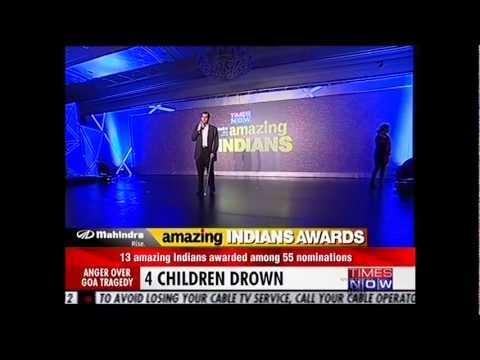 The following video from Times Now Amazing Indians Award ceremony shows the extraordinary story of Ashish Goyal. Ashish Goyal also has the credit being the first blind trader with financial giant JP Morgan and possibly the first in the world. Ashish worked in JP Morgan’s Chief Investment Office in London as a portfolio officer and used screen-reading software to check his e-mail, understand research reports and presentations. Having achieved success though hard way, Ashish Goyal plans to inspire many people who are at odds against the appalling outlook of the society. Ashish Goyal was ably recognized by the government of India for his proud achievements with the National Award for the ‘Empowerment of Persons with Disabilities’ in 2010 by the then president Pratibha Patil. Ashish joined Bluecrest Capital Management in UK after leaving JP Morgan. Ashish through his sustained efforts, now wants to create awareness for the people battling with such disabilities and make society acknowledge their efforts and talents. We salute such unsung heroes of the society like Ashish Goyal who battle against the anarchist approach of the society and make this world a better place to live. Ashish Gupta is a Delhi university graduate and an ex-banker with rich corporate experience. Ashish is also a published author and movie script writer. Want a personal health coach always with you?